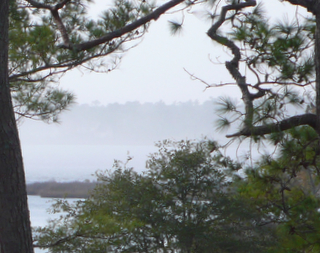 Today, December 29, the air temperatures on North Carolina’s Crystal Coast are so warm that fog is forming over some of the rivers. Sometimes I think we live in a fog of technology. While the river fog will go away when the weather changes, I think we have to work at losing the technology fog. Almost every home has a computer, and lots of people depend on email to do their jobs and to stay in touch with friends. Most people, not including my wife, use a cell phone with a camera phone. Wireless networks are everywhere, and few homes are without an all in one printer/scanner/copier. Then there are the digital cameras and movie cameras. We have HD televisions with HDMI inputs so I suppose the next thing is a Blue Ray or HD DVD. We were in Best Buy the other day and actually stopped for a couple of minutes to look at a comparison between Blue Ray and regular DVD. I will admit to the Blue Ray images being stunning. What I can do with the technology that we already have in the home and that which is accessible on the web like geotagging and Google Earth is astonishing. While I cannot yet send an image that rivals Blue Ray, I can send some very stunning images. Someone sent me some fantastic images that are going around the web. While my images might not be quite in the same class, they aren’t bad. I think a lot of people can say that these days. We have such good tools today, that anyone can be an expert, by capturing an image, balancing the color a little, and easily sending it by email or MMS. Not only can you send it to someone, but likely they will be able to get it even if they are traveling. There is so much content, some of it very high quality, and delivered very quickly that we are in an information fog. There are people who have trouble processing it all. And above all it is harder and harder to get information to stand out. It is easy to lose track of what you want to focus on because there is so much information. Sometimes it is more than you want or need to know. There are times you have to back away from the technology and what it delivers until you can see through the fog. Too much information can take away your decision making ability. Maybe I am old school, but once in a while you have to go with a gut feeling and not let yourself get overwhelmed with instantaneous high tech data. Once in a while, all this high tech stuff lets you turn something not so appealing into something not exactly as good as it looks. Maybe it helps to go back to a basic computer that does not overwhelm you with its possibilities. I am trying that with a new Zonbu computer.